Ever wondered how many points you’d get if the police followed your ride to work? Chances are it’s more than you think. Way more. We decided to ask the law what they thought of three typical commutes. Everybody breaks the law. Even your auntie, the one that you used to fancy a little bit when you were a teenager. When she drives to work in her Daewoo, she creeps over the speed limit. Guaranteed. It’s fair to assume, then, that if you own a motorcycle and you read a magazine like this that you’re hardwired to lean on the boundaries of legality and safety when you go out for a ride. How hard you decide to lean against the law depends on a number of things. 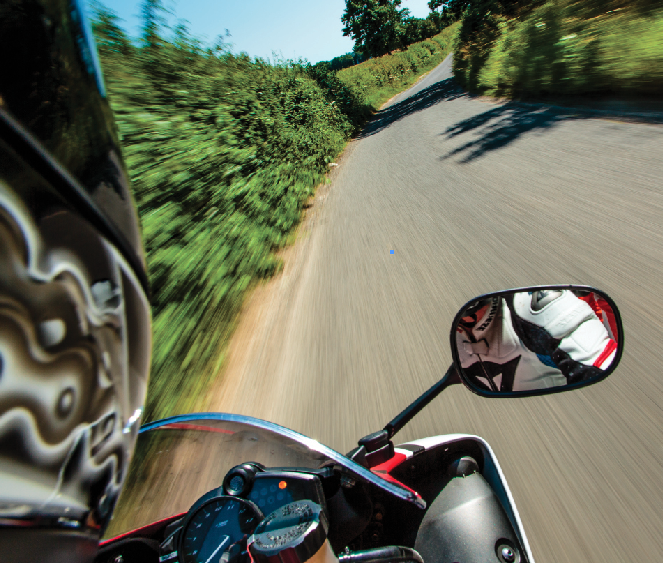 Being familiar with your surroundings is usually one of the key deciding factors in how you ride. By that I mean you ride faster down roads you know than those you don’t. So of all the riding you do, the route you do the most is likely to be the one where you ride with the least consideration for personal safety, and legality. The riders in the videos all rode sections of their daily commute to work. They knew where they were going and rode exactly as they normally do. We’ve protected the identity of each, illustrating them with staged photography, so as not to incriminate them in the same way that YouTube dorks do when they post videos of themselves doing million mph wheelies, then pulling onto the driveway of their houses and giving themselves away.The BikeSafe team from south London assessed each ride then presented an analysis. All the videos were sent to us anonymously, so as to prevent the nice Policemen from doing their job and immediately arresting the riders. Grab a coffee, sit back and see which one of these rides matches the kind of riding you do most. Chances are, you’ll probably ride home differently compared to how you rode in. ‘Rider A’s’ ride is a mix of dual carriageways and A roads. 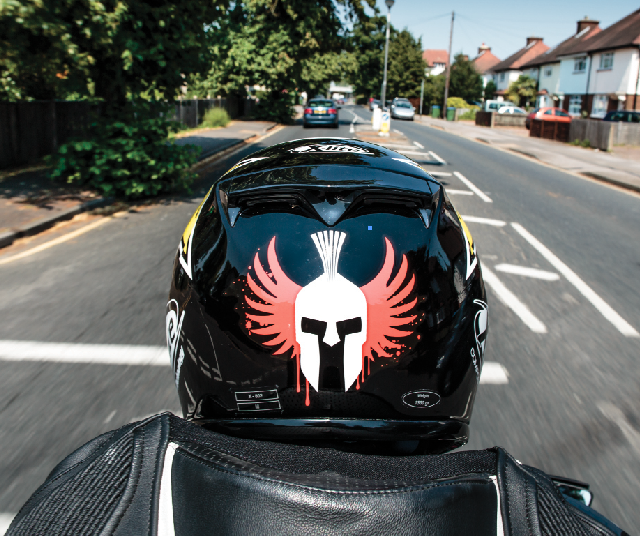 Here’s what the BikeSafe team thought about ‘Rider A’s’ riding.Rider one has been riding on the road for seven years. He has three points on his licence for speeding and has had three at fault accidents on the road, all lowsides due to a lack of grip. He completed a BikeSafe rider course five years ago. For the purpose of this feature we’ll refer to this rider as ‘Rider A’. At one stage in the video, ‘Rider A6’ comes up behind a Porsche. It’s clear that he wants to have a play, he drops right back and pins it, full gas, completely ignoring five give away hazard warnings. He perfectly demonstrates the typical thought process that riders have with the Highway Code. He has clearly demonstrated an understanding of what the signs mean once upon a time to pass his test. What he’s done since then is forget to apply any kind of reaction to them once he’s seen them. What he was given in the section pictured is five individual signs that there is something around the corner that has been recognized as a hazard and that he should slow down.Rider A is interesting. One of the most common mistakes people make on higher speed roads like these ones, is to assume that because the limit might be 60mph, that it’s acceptable to ride at 60mph everywhere. If you had a non-fault collision at 60mph, you could happily go to court, the other person gets prosecuted for driving without due care and attention and you come away with a nice pile of compensation. If. That. Happens. 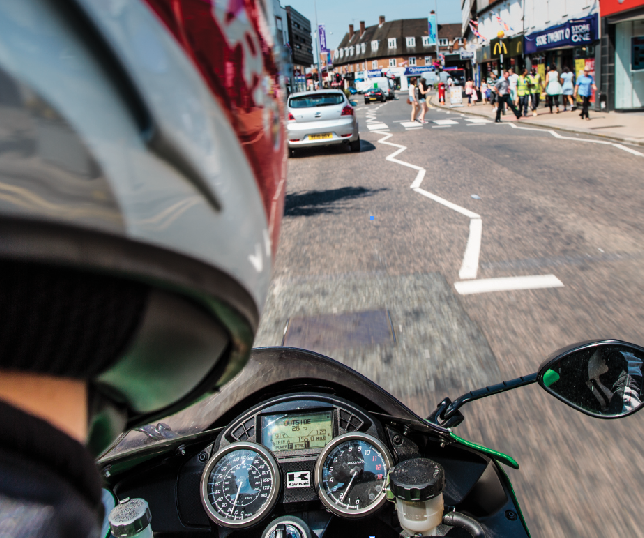 We know from experience that most bikers don’t survive 60 mph collisions regardless of whose fault it is. The government hasn’t spent money for nothing producing these warnings and he needs to slow down. This rider ignores them. Imagine if in place of these signs there was a man covered in neon lights, shouting ‘Slow down, it’s dangerous up here!’ with a loudhailer from the side of the road. You’d soon back off. We all liked the way that this rider dealt with particular hazards. It was clear that he was applying a method that works when he didn’t have 100 per cent visibility or wasn’t completely happy with a situation. In general he was using the right part of the road at the right time. There was very little in the way of risk taking and, in general, this commute is the one that all of the members of the BikeSafe team were most happy with. This chap here doesn’t make many mistakes. We did have issues with the wheelies he pulls. In court that’s classed as not in proper control of a motorcycle. I know there’ll be people reading this that know how much control is required to balance a wheelie. But you simply can’t slow down in time and are therefore reducing the amount of control you have of the motorcycle. With the best will in the world, most people’s reaction time is around one second. If you think about your typical thought process when you’re riding a road that you know, your concentration will be on other things because you know exactly where you are going, so, when you should be looking at what’s going on around you, you’re actually thinking about what you’re going to do when you get home. From the point of view of offences, we’re fairly certain he was speeding in the 30mph limits, as well as creeping over the 60 limit, too. One of his overtakes could be classed as dangerous driving and there were a couple of wheelies that are just plain inexcusable. We all agreed that while he had good hazard awareness, he was definitely lacking in consistency with his ride. This probably comes from a drop in concentration because he’s so familiar with his everyday route. Let’s say that you roll off the speed from 60 to 40mph for just five seconds once over a 30 mile commute. You’ll only lose a 40-metre gap on yourself, but you will be reducing your speed and increasing your reaction window. That one time that you do it could turn the crash you didn’t see in time, into nothing more than a hazard that you spotted, reacted to and left behind in your mirrors. ‘Rider B’s’ ride is a mixture of built-up areas and lower limit semi-urban A and B roads. Here’s what the BikeSafe team thought about ‘Rider B’s’ riding.Rider two has been riding on the road for ten years. He is currently point-free, but has had seven ‘at-fault’ crashes on the road, a mix of excess speed and stupidity. He hasn’t completed any rider training. For the purpose of this feature we’ll refer to this rider as ‘Rider B’. He wheelies past a car and a cyclist at the same time and when he puts overtakes in on cars, he doesn’t pay any attention to the driveways of the houses on the opposite side of the road. We could see him skidding up to roundabouts and generally playing in the traffic, it just looks like a cheeky ride. In one section he makes a roundabout of a junction and turns round on the opposite side of the road. If a policeman saw a rider doing a manoeuvre like this, he’d pull you in an instant. Once you’re at the side of the road, the policeman can then go over your kit, your bike and your documents at their leisure.When you’re riding in a semi-rural environment, the common mistake is to carry the speed of a rural ride into an urban environment. 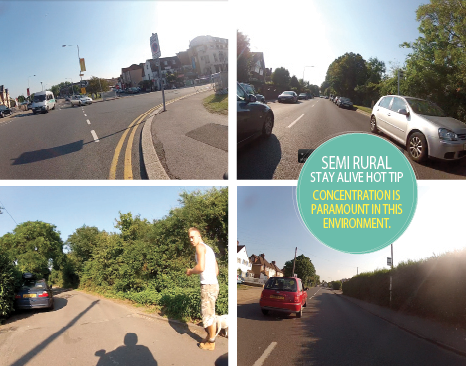 It’s vital for us collectively as bikers not to draw attention to ourselves in a negative way and speed is the best way to get the public to point the finger at us. This rider is basically riding like a complete hooligan. Aside from the legal aspect, all he’s doing is the rest of us a disservice. He’s carrying excessive speed everywhere. Do you really want this to happen? Think about the houses that this guy rides past everyday, speeding and making noise. If in a couple of those houses there is a young family trying to get a new baby to sleep after a restless night when they hear the same speeding bike at the same time every day, they’re going to naturally associate bikers with the stressful situation they’re in. That’s not doing any of us any favours. This semi rural environment is clearly on the outskirts of London, so if we look at the statistics for this place in particular you’ll see what our issue is. For every 98 cars you see, there are two PTWs (powered two wheelers). Yet, one in four fatal accidents in London involves a PTW. This is a horrendous statistic. This rider makes no effort at all to make any concession for his impact on the traffic. We got the feeling this rider was generally frustrated with the way the rest of the traffic was moving around him and just does what he wants. The section where he accelerates down a back road past a man walking his dog annoyed all of us. The way this rider chose to deal with the situation appeared to be with a complete lack of care for anyone else around him. He could have slowed down, pulled his clutch in and given the pedestrian some space, instead it looks to us like the bloke has to squeeze himself out of the way of the bike just to let it through. Towards the end of the video, he overtakes without due care and attention, showing a complete lack of planning and guaranteeing himself a write-up. The common theme between this rider and the urban rider in the next case study is aggression. This guy is, law aside, not doing us as bikers any favours at all. We thought that he was a maniac. As good or as bad as the other two riders are, we feel that this rider is the one that could leave the biggest mark on the public. Legislation is but a sweep of the pen away. Motorbikes with 106 bhp, bikes that are illegal to modify. All this could happen and if it comes down to a vote from the public, their association with bikes will come from experiences like this rider is giving them. None of it is good. Everything we think about is for safety. If this rider could position for safety, he’d be improving his chances of seeing a hazard. After that he’s left with the option of rolling off the gas if he spots something that he’s not happy with. He’ll be giving himself more space and more time to react to what’s happening around him. In one instance it’s clear to see a pedestrian stepping into the road and then leaping back once he sees the bike coming towards him. Yes, in this case an accident was avoided, but think about what that pedestrian would say if he turned to watch the bike riding down the road and it hit someone else.The guy riding in town has far more hazards and laws to deal with than the chap that gets to ride up and down a rural A-road everyday. This rider would be banned twice over and would accumulate over 20 points on this ride. We really liked the fact that not once during the ride did he stray into the bicycle boxes at the traffic lights. The key to solid urban riding is to not get worked up by what everyone else is doing. In the video we see the same pushbike catching up with the rider at four separate sets of lights. Each time the bicycle comes into view, it breezes straight through a set of red lights. Yes, this is frustrating to see as a motorist, but getting worked up and charging through the traffic isn’t going to stop that guy from running those reds. He’s riding way too quick. In the first minute of the video there are two potential accidents with pedestrians that could easily land the rider in prison thanks to death by dangerous driving. He’d be the perfect witness in court to stand up and say that ten seconds before this rider hit someone else, he himself had to jump out of the way of what appears to the public to be a reckless, speeding rider. We ride in town constantly thinking about stopping distance. The trouble is, all bikers know that at a given point in the rev range of pretty much any bike, what to a member of the public is going to sound like you’re racing around, is in actual fact you just getting your bike moving with the flow of the traffic. The biggest problem this rider has, and it’s a common mistake for riders that have been riding for a fair few years, is that he clearly doesn’t understand one law in particular and repeatedly commits the same offence all the way through his ride. Overtaking the lead vehicle nearest a zig zagged pedestrian crossing is an immediate three points. Whether it’s in one lane or two is irrelevant. Urban environments are fraught with hazards and if you’re constantly exposed to them, you become desensitised to them. You have to think about who else is using the road. In a couple of places during this video, the rider passes between a cyclist and a car so close that we all held our breath. This isn’t good. We also saw a Suzuki SV in front of this rider, pulling around a keep left bollard in traffic. This is such a cheap shot for us, it’s a real easy ticket. If this ride is like yours, next time you’re out, think about what you’ll gain by sneaking these little offences. How much sooner will you arrive at your destination? Is it really worth it? You may think it’s such a small thing, but these signs are in the road for a reason, and we promise it isn’t to generate revenue. Like the rural rider, this guy just doesn’t read the signs. 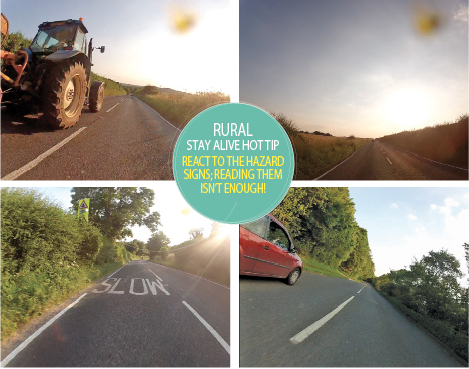 The difference with the rural rider is nine times out of ten the signs will prevent him from having a crash due to excess speed. In an urban environment the signs will prevent an accident and save the rider from getting some points. If this rider shaved some speed off his ride, he’d have more time to read the signs that will keep him safe, but he’d also have more time to read the signs that could help him make better progress. We love the fact that most motorists in London don’t read the bus lane signs enough to know when they’re open, because it means we can use them without getting caught in traffic, but realistically, if they were more aware of the signs then they could all make better progress. We liked the fact that when it was clear on the opposite side of the road he was making use of it, but we would have used even more; take as much as is safely possible. There seems to be a lack of planning, too. If there was less pace then this rider would be able to assess where best to position his bike to prevent other road users from blocking him and slowing his progress. We all agreed that it just looks like a really aggressive ride, lots of hard acceleration followed by loads of hard braking and it doesn’t appear to be getting him anywhere quicker than if he just sat back and filtered cleanly. We see this rider rectifying mistakes before they become hazards, but when you combine the excess speed and the amount of dangerous manoeuvres, it’s just another gambling roll of the dice that this rider makes. From start to finish the video is full of the rider placing complete and utter reliance on all of the other traffic in doing what he thinks it’s going to do and it’s only because the rest of the traffic is clueless as to the rider approaching that they don’t get chance to react to his presence. It’s scary to watch this video and is only a matter of time before this guy lands himself in trouble, or under something. Familiarity does indeed breed contempt. What you may have failed to realise is that familiarity is also the perfect harbouring ground for scoring more points than a Chinese gymnast. Just because you know that set of curves inside out doesn’t mean that you know what’ll be hiding behind a bend next time you ride through them. Obviously if you live out in the Bondu, there’s less traffic to consider, fewer risks to deal with and less stress to cope with. That’s not to say that you’ll have it all easy though. The quieter and more open the roads, the greater the chance of your speed creeping up, meaning you could find yourself running into hazards at a much greater pace than you anticipated. This would explain why most of the crashes that happen in rural areas involve riders out braking themselves into solid objects or running wide on the way out of corners. If your ride matches the semi-rural case study, you run the risk of blending the worst parts of inner city riding with the worst parts of rural riding. The key thing to consider if this ride is like yours, is the social impact your ride has. If you’re drawing attention from the public with your riding, you’re not doing any of us any favours. The urban ride is clearly the one that carries the most risk. When a city ride bites back, it’ll be harder than the other two on your licence. 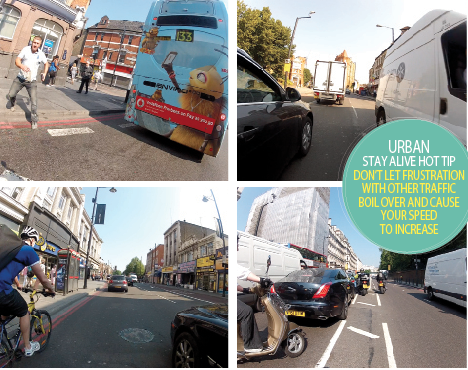 Our city rider case study has been riding pretty much every day in London for the last eight years, considering the worst case scenario and legality has clearly given way to aggression and impatience. This isn’t good. If this ride reminds you of your riding, you need to brush up on the law. Not knowing or forgetting simple rules of the Highway Code is an excuse that simply won’t wash with the cops. When you begin your life as a biker you inherit an imaginary empty bag of experience and a full bag of luck. The trick is being able to fill one before the other one runs out. If you’re feeling lucky, chances are you need to slow down. The bottom line is this; if you can ride every mile of every ride like you don’t know where you’re going you will have a licence for longer, more importantly, you’ll be massively reducing the odds of you being that guy you try not to notice at bike shows in a wheelchair, or worse. Who are the BikeSafe team?